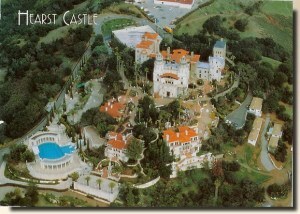 Hearst Castle is a palatial estate on the central California coast and a National Historic Landmark. It was designed by architect Julia Morgan for William Randolph Hearst‚ a newspaper magnate from 1919 until 1947. In 1957, the Hearst Corporation donated the property to the state of California. Since that time it has been maintained as state historic park where the estate and its considerable collection of art and antiques are open for public tours. Despite its location far from any urban center, the site attracts roughly one million visitors per year. Hearst formally named the estate "La Cuesta Encantada" ("The Enchanted Hill"), but usually called it "the ranch". The castle and grounds are also sometimes referred to as "San Simeon" without distinguishing between the Hearst property and the unincorporated town of the same name [wikipedia].